If you need to export goods from one country to another, one of documents you need is a commercial invoice. Commercial invoice forms of invoices are used for customs clearance and are mandatory in international trade. The customs relies on it to assess the value of the goods entering the country and to verify the contents of the goods. Most countries are very strict about the export and import of goods. Customs departments in different countries have different rules and regulations. When you are shipping from China, you should prepare commercial invoice to avoid many problems in transporting the goods. If this document is missing, the shipping company may refuse your goods, and even the customs will detain your goods. Commercial invoices are created after a transaction agreement is reached above the sale. It is from the seller to the buyer’s bill or proof of purchase, which describes the agreement between the parties regarding the details of the sale or purchase of the goods and the terms involved. Commercial invoices are mainly used for customs clearance of goods between countries. Customs officers relied heavily on the document when cleaning up the goods. It often need to accompany goods for international delivery. Commercial invoices are usually used to provide information to customs and should include all necessary details related to the goods. It adequately describes the goods being transported, the location, quantity, cost, location of the transport and the name of the company involved in the payment. Commercial invoices are used by customs in the importing country to calculate the exact cost of the goods, to calculate tariffs, collect statistical data and check the transport of goods. Any description of the possible error and lack of information will result in strict customs scrutiny, so you must ensure that all necessary information is provided. Commercial invoice plays three roles. (1) The main use of commercial invoices in imports is to calculate tariffs. In the import and export of goods, the shipper or consignee needs to submit commercial invoices to customs, which is a necessary condition for customs clearance, and helps the customs Department to inspect the goods exported and imported from other country. (2) The importer can understand and master the overall situation of the goods shipped. The invoice directly indicates the details of the goods and includes the identities of the parties to the transaction, both the buyer and the seller are fully identified. (3) without the use of remittance certificates, invoices may be used as supplementary documents for payment. In addition, the invoice can be used as a claim basis for the value of the goods once the goods are damaged or even lost. By using a template, you can make writing invoices an easy task. A professional invoice can reflect the company’s time to seriously focus on every detail. Therefore, the invoice style should be designed very well, easy to fill out, looks concise and clear. The invoice is a legally binding document and must contain basic information to ensure that you do not encounter problems in the process of sea freight or air freight by the Customs department. A commercial invoice containing the correct information ensures that the goods can be legally transported between countries. Note that the items listed below are not necessary. Issuer: The file is usually created by the exporter. The address and contact method of the exporter. To: Importer’s address and contact number. Invoice number (No. ): Generated by the exporter. Invoice Date: The date on which the invoice was generated and mentions the delivery date. Shipping Details: Mode of shipping. Contract number (L/C No. ): Under the transaction the letter of credit, the invoice needs to include the L/C number. Term of Payment: Terms and conditions of payment agreed by the exporter and buyer. Terms of Sale: Trade terms also become incoterms. The common option is FOB and CIF. Marks and numbers: Shipping marks includes information about the shipment. Description of Good: Name of each commodity traded. Quantity: The quantity of each item of goods. Unit Price: Cost of each item. Subtotal (Amount): Total value of individual commodities. Total value of the goods: Total value of all items. Each country’s customs laws are not the same, commercial invoices may also need to include VAT tax number, signature, HS Codes and more. How Do I Get A Template For Commercial Invoice? There are many samples of this business document on the Internet. 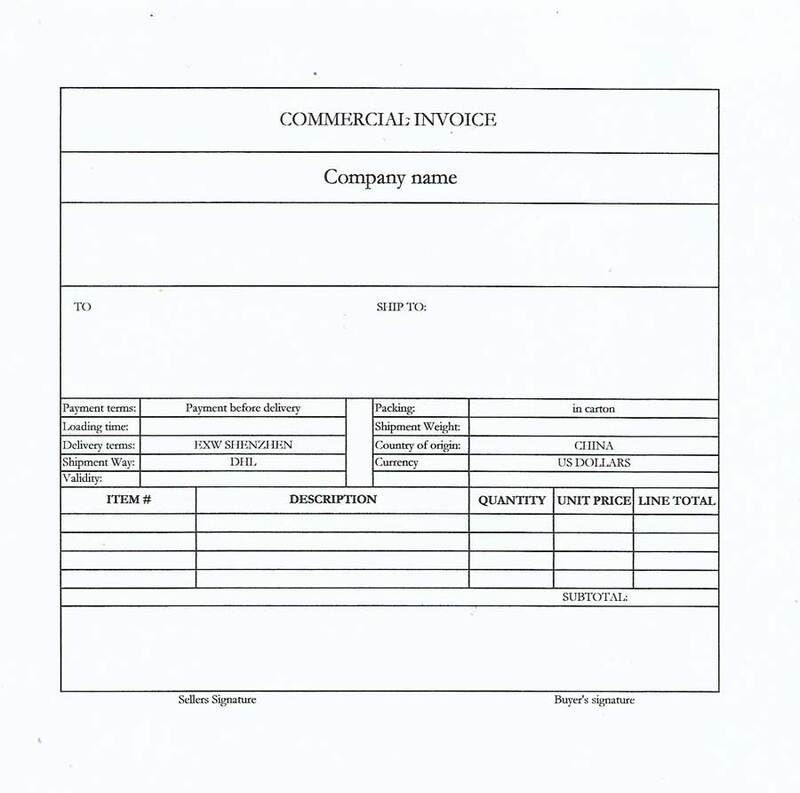 input “commercial Invoice sample” In the search engine, you find countless templates, many of which are free to download. The commercial invoice template does not have any specific format, but it must contain important information. As a professional freight forwarding company, we handle many commercial invoices every day. We know how to fill out a commercial invoice project, a strictly accurate invoice as an accompanying document can help you avoid delays in shipping. When you are shipping personal belongings, you need to make it. If you don’t know how to fill out or need a sample, we can provide it for free. We will also make sure that your invoice includes every necessary detail to avoid any point of detention during the import process. As we know, commercial invoices are one of the legal documents. When the goods are imported and exported, the Customs Department checks the commercial invoice, but it usually asks for more documents in order to get a thorough understanding of the shipment. Each country’s documentation requirements for import transport are specific, and any minor discrepancies between documents are sufficient to delay your shipment. You know which document you need to submit and when and where to help you keep your shipping status and make sure things go smoothly. International transportation companies have extensive experience in cross-border transportation to ensure that your paperwork is fully completed. Usually, commercial invoice is very important in international trade. It allows your goods to be lawfully passed through the border to another country. Therefore one must authenticate to regard it. If you have any comments or questions, we look forward to receiving your letter! Do you have any other questions? Or using our Shipping Blog, our experts also published other post.